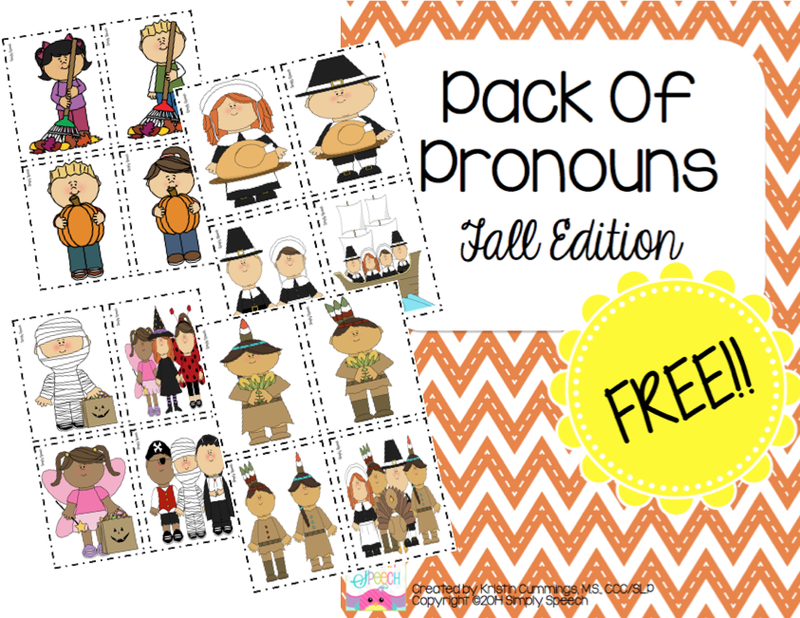 Speechie Freebies: Pack of Pronouns: Fall Edition! It's October 1st which means that we should be feeling fall in the air! I am not so much here in Florida with 85* weather, but my speech sessions sure are getting some fall festive fun! I have quite a few little guys that are working on pronouns right now- both identifying and using them correctly. I have practically worn the lamination off my first Pack of Pronouns activity so I decided to make a fall edition! This free packet includes 20 picture cards that can be used to target he/him/she/her/they/them. I have used these cards in a number of ways…. 1. Put 2-3 cards out at a time. Describe one of the cards using a pronoun and have the child identify the card you are taking about. "Show me: She is holding a turkey." 2. Play a board game but before the child takes a turn, he/she chooses a card from the deck and has to describe it using the correct pronoun. 3. Use these cards to assess pronoun knowledge/use. 4. Print out 2 copies and play "pronoun memory" with them! You can download a copy of this packet in my TpT store here! what a great packet! thank you!